The 15M Movement stops Josefa Doblado from being evicted from her home on Primavera Street in the Hermandades de Sevilla neighborhood. Tuesday 19 July 2011, 9 a.m.: I get on a bus in Seville’s Ronda del Tamarguillo. I’m headed to the western side of the city, where a crowd will be gathering to prevent an eviction. The harsh sunshineis beginning to get hot and I think the light, which can be blinding at midday this time of year, will inevitably blur the outlines of the photographs I take with my pocket camera. I get off the bus at the intersection of the Los Naranjos, Polígono Norte and Hermandad del Trabajo neighborhoods. I arrive in good time and I begin to wander around with the camera. I look at the compact housing blocks: low-cost housing built during Franco’s time for the working classes and replicated throughout Spain, and I remember having played in similar neighborhoods where my relatives lived several decades ago. The metal plaques on the facades attest to that fact and always read the same: “Ministry of Housing. National Housing Institute. Building constructed under the officially protected housing system.” Next to the text is a familiar symbol: the yoke and arrows that the Franco regimeadopted from the Falange movement and that at one time identified the National Housing Institute. I suddenly realize that yesterday was July 18th; the 75th anniversary of the monarchical-fascist military uprising that sparked the Spanish Civil War and paved the way for forty years of genocidal military dictatorship. Under the law commonly known as the Historical Memory Act, enacted four years ago by the Spanish parliament, all the commemorative images of the dictatorship had to be removed from public and administrative spaces, but these plaques have been overlooked. It seems they’re not the only thing to have been overlooked. I view these signs as part of a war of symbols engraved on the city’s skin. I take a photograph that sums up the symbolic universe of the civil war. In the background is a brick façade with three signs on it: one is the old Franco-era plaque, the second a recent sign the size of the width of the house’s outside window, put up by a major real-estate company toannounce that the house is for sale. The third is a humble photocopy of a poster that seems to test its strength from below, an impression heightened by the silhouette in profile of a young man speaking through a megaphone to the real-estate sign on the left. 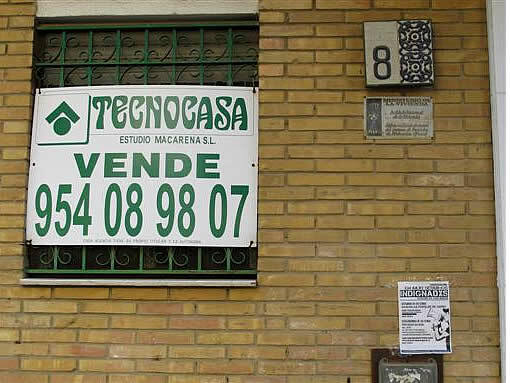 What is this unsophisticated image shouting at the Tecnocasa real estate sign? That the community assemblies are set to continue during July: the M15 Movement’s redefining of neighborhood jurisdictions, one of the mainlines of escape to which the ongoing May and June camps have resorted [see tomalaplaza ]. It’s the M15 Movement that has organized the protest opposite No.2 Primavera Street. I get there early and join the group of sixty people. The demonstration does not make for very expressive images. Even so, a closer look reveals the complexity of this image of a circumstantial collective. Its composition is a hodge-podge of young activists, neighborhood organizers, and inhabitants for several generations of the Hermandades or La Macarena districts. The posters and leaflets being distributed show how, here too, the 15M Movement is made up of formal and informal groups: Asamblea de la Macarena, Asamblea de Cerro Amate, Liga de Inquilinos La Corriente… several T-shirts are also emblazoned with the logos and designs of bars and cooperatives or social centers. As is usually the case, the sign “15M” acts as an umbrella organization for the group, in that it’s a non-identity that empowers without unifying. 10:30 a.m.: two young men call for everyone to regroup opposite the housing block for a briefing session. They report that the eviction is scheduled to take place at 11:15 by court order. It’s very likely that police will be present in view of the visibility this case has taken on, and the fact that since the movement is fully transparent, the call to demonstrate has been made public in several media under the slogan “Stop evictions”. We don’t know how many and what kind of police to expect. But they’ll probably try to enter the building by force. We are given precise instructions: a collective sit-down blocking the main entrance, arms linked, a confident attitude, maximum resistance to prevent the eviction. Strictly peaceful behavior is called for, without responding to possible police intimidation or violence. Everyone’s in agreement; the members of the neighborhood nod emphatically. The first group sits on the ground, occupying the open space outside the entrance to the building, and leaving a corridor to give access to the building’s residents to pass. We’re now a group of over one hundred people. So far I haven’t seen Josefa Doblado, the tenant who we came to defend. Twelve years ago, Josefa’s nephew needed a van for his work. No bank was prepared to extend a loan with which to buy the van without a property as collateral. Josefa “sold” her nephew her home for a symbolic amount so that he could mortgage it and thus secure a 30 000 euro loan with which to buy the vehicle. They paid the first installments, amounting to some 8 000 euros, until the nephew was left without a job. Time passed and they were unable to continue making the payments. To prevent her home from being auctioned, Josefa and her nephew did whatever they could to pay the debt. In 2008 they managed to gather the remaining amount plus interest: 29 000 euros. In other words, they paid the bank more than the original cost of the van. However, the bank responded by saying that was not enough: according to their calculations, after adding interest in arrears and legal costs, the debt now stood at 52 000 euros. Legal costs? That’s right: some time before, without advising Josefa and her nephew, the bank had initiated proceedings to foreclose the mortgage and place her home up for auction, which was finally sold for 42 000 euros, when it was valued at 172 000. Josefa, who is 69, lives off a pension of 400 euros a month and has been living there for 40 years. The bank responsible for this process is Banco Bilbao Vizcaya Argentaria (BBVA). I still haven’t seen Josefa but I imagine she is in her first-floor apartment, whose open balcony shows a bustle that contrasts with the peaceful crowd below. Press and television crews haven’t ceased showing up since I arrived. Reporters come and go between the apartment and the street at their ease, carrying professional camcorders and cameras on their shoulders or in their hands, holding microphonessheathed in foam rubber with the TV channel’s logo. Several connection cables hang from her balcony. I follow them and some 300 meters away come across a van with a parabolic antenna, surrounded by vehicles withthe logos of local and national media on their side doors. I smile for a moment upon realizing that the press equipment is worth far more than the value of Josefa’s mortgage on her apartment.